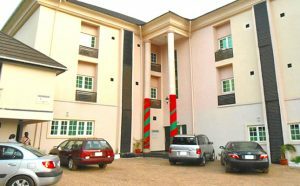 Laropa Hotels & Suites Gwarinpa, Abuja, offers affordable hotel accommodation facilities featuring well maintained and tastefully furnished rooms. Located in Gwarinpa area of Abuja, the hotel is centrally placed for easier access to major tourist attractions and places of interest such as Nnamdi Azikwe International Airport, National Stadium, National Assembly Complex and Federal Secretariat among other places. Laropa Hotels & Suites is carefully designed to provide for both business and leisure travellers. 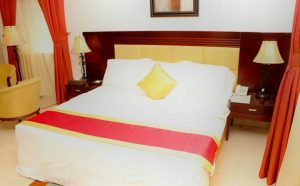 It offers affordable, comfortable and peaceful environment for your relaxation. The hotel rooms are spacious and well maintained, designed in glazed tile flooring, POP ceiling and built with wardrobes and en-suite bathrooms with bath tubs. Each room is fitted with an air conditioner, a standing fan, a ceiling fan, a flat screen television with satellite channels, a refrigerator, cushion chairs and a reading or dressing table. The hotel provides room service, stable electricity supply, on-site parking space and a guarded premises. Laundry is offered on-site at a surcharge. Laropa Hotels & Suites also offers a pick up services from your point of arrival to ease your movement around the city. Managed by a team of experienced professionals in the hospitality industry, the modern facilities and the unique ambience settles you into the most relaxing stay. 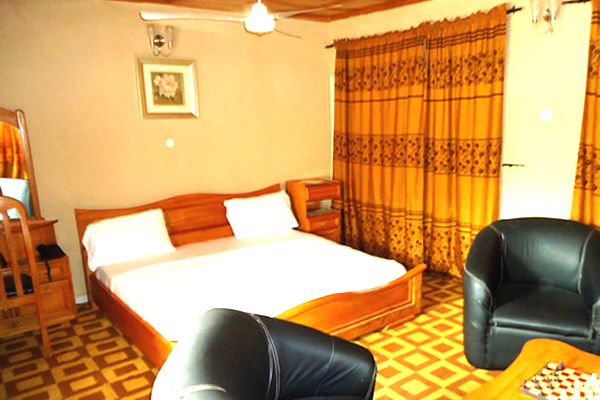 Rooms at Laropa Hotels & Suites are spacious and well maintained. Some of the rooms feature king size bed while some feature queen size bed. All the beds are big enough to comfortably sleep two guests. 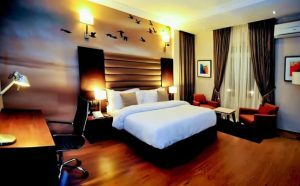 Some rooms are also equipped with wardrobe, reading spot lights, flat screen TV with cable channels. Other facilities include air conditioning system, internet access, refrigerator, in-room telephone, bathtub and shower. Classic room is a large room option for guests in need of space. The room features a queen-size bed, air conditioning system, wardrobe, bedside table, intercom telephone, standing fan and ceiling fan. Other room amenities are refrigerator, cushion chair, reading/dressing table, flat screen television with satellite channels and an en-suite bathroom with a bath tub. Occupancy: 2 | Rates From: ₦10,000. 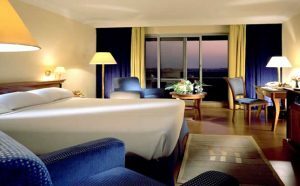 Deluxe Room also features spacious and well maintained rooms, tastefully designed to offer maximum comfort and total relaxation. The room is equipped with a queen size bed, air conditioning system, wardrobe, bedside table, intercom telephone, standing fan and ceiling fan. Other room amenities are refrigerator, cushion chair, reading/dressing table, flat screen television with satellite channels and an en-suite bathroom with a bath tub. Occupancy: 2 | Rates From: ₦15,000. Laropa Hotels & Suites blends earthly seasonal flavours and bold ingredients to create exquisite contemporary cuisine. They have replicated the elegant interior, exceptional service, and world class cuisine in their hotels around the country. You can enjoy the hotel’s mouthwatering delicacies at their Coffee Shop or inside the rooms.